Get three travel gadgets packed into one; this Wi-Fi router enables you to connect to the internet on multiple devices wherever you are. Three Travel Gadgets In One! Work on the move and update your Facebook with photos of your travels; this WiFi router will enable you to get internet on the go on up to 10 devices including phones, tablets, cameras, games consoles etc. Never run out of battery again! The WorldSIM Tri-Fi is a 5200mAh mobile powerbank that can charge your phone or tablet without having to be plugged into a power source. Charge you gadgets while you travel, on the train or at that all important business meeting, and with the high battery capacity you can even charge power hungry devices. With an external storage slot that fits a micro SD card up to 32GB (not included), you can store your travel photos, important files, presentations and more. 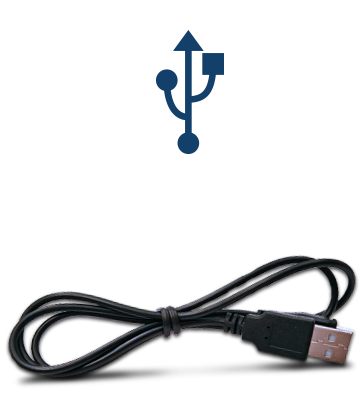 You can also easily transfer files between your phone, tablet and laptop. Included with the WorldSIM Tri-Fi is a data roaming SIM card so you can get internet on the go in 188 countries, at a fraction of the cost. 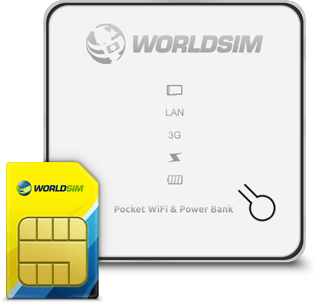 The WorldSIM Data SIM card can reduce your data roaming costs by up to 85%. 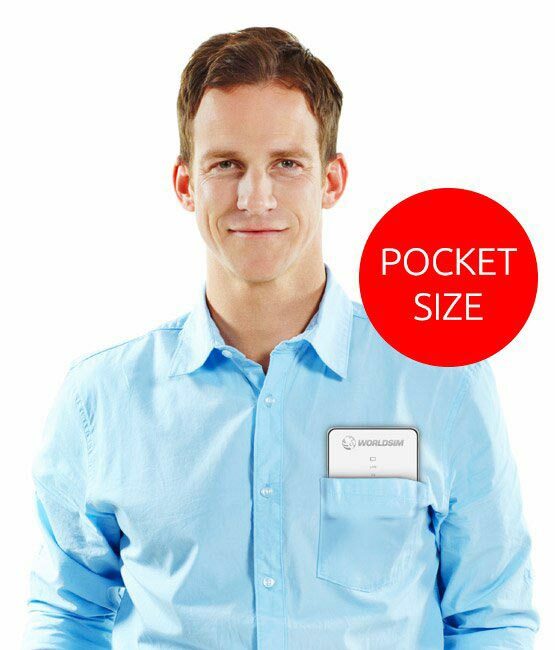 The Data SIM card which is included with your Pocket WiFi is comes with £20 free credit so you can start using it immediately, if you purchase this product with more credit you will get better value for money. Credit will expire only if the SIM isn’t used for a year. Charge your WorldSIM Tri-Fi on the move with the in-car charger. This will make sure that when you need to use the Tri-Fi as a powerbank the Tri-Fi has enough power to change all your other devices when you run low on battery. When you’re not in the car you can charge the Tri-Fi with the micro USB cable included to ensure you always have portable power when you need it. You can charge using your phone plug or charge from your laptop. 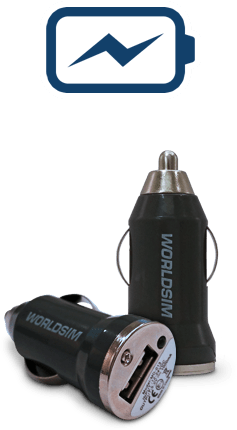 TheWorldSIM Tri-Fi has an Ethernet port, this enables you to plug it in directly into an internet source so you can then set up your own WiFi network for all your devices. Included with the WorldSIM Tri-Fi WiFi Hotspot is the WorldSIM data roaming SIM card which gives you low cost internet on the go in 168 countries. The WorldSIM Tri-Fi is a WiFi Router so you can use it to access the internet on up to 10 devices including phones, tablets, games consoles and laptops. The WorldSIM Tri-Fi has a slot which supports a micro SD card up to 32GB (not included) so you can store all your files on it and easily transfer files from one device to another. 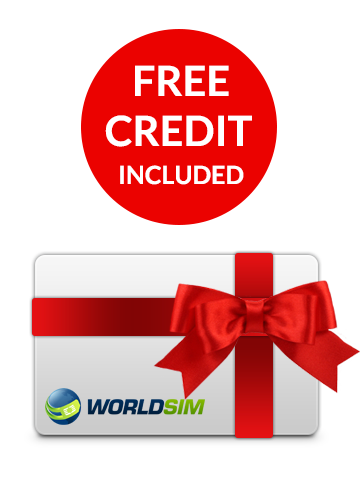 This product comes unlocked so you can use any SIM card inside, but we do include a WorldSIM data SIM card for free. If you need assistance, our customer service team is always available. You can call us 24 hours a day or get help though your online account. The WorldSIM Tri-Fi gives you portable power so you can charge your gadgets on the move. You can use the Tri-Fi as a powerbank and its high capacity 5200 mAh battery will keep all your gadgets charged. The included data SIM card is pre-paid so you can top up when you need , worldwide. Top ups can be done online, automatically or over the phone. It is so simple to deal with WorldSIM. Fast postage. Quick response. Would highly recommend I have been with them for years. Overseas rates are good compared to local roaming rates. Extra power and WiFi too. I have enjoyed my TriFi power bank. Nice to have the extra power along with WiFi when in an area that has no reception. I will take it with me all the time.